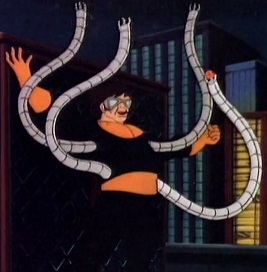 Powers/Abilities: Doctor Octopus was a criminal mastermind and scientific genius. His mechanical arms were highly durable and capable of great strength, as well as having laser and blade attachments. 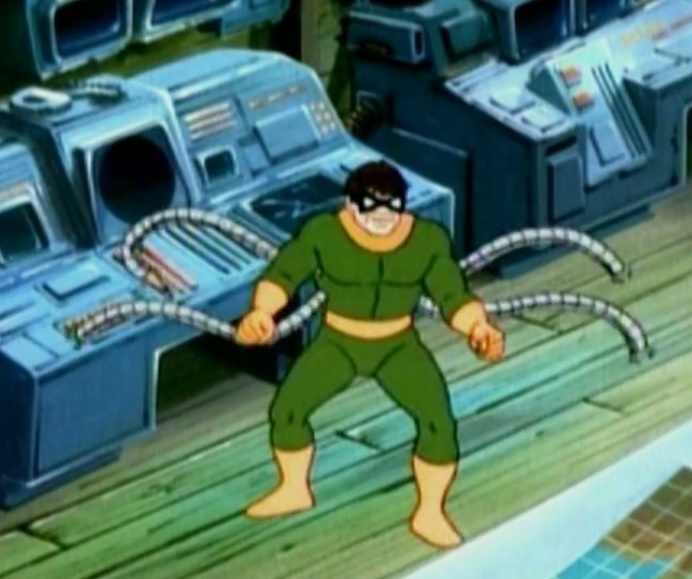 History: (Spider-Man cartoon episode - "Bubble, Bubble, Oil & Trouble") - Doctor Octopus, using his mechanical arms, was inside the New York Cultural Museum trying to steal a million-dollar ruby. He boasted of his genius before Spider-Man arrived, drawn there by the noise, but Ock swatted the hero off the building. With Spider-Man thus occupied attempting to save himself, Doctor Octopus escaped with the ruby in his possession. Sometime later, Doctor Octopus made his way to Empire State University. Reading the paper while his mechanical arms worked their way through the water pipes, he directed them to slip inside a science lab and cracked the lab's safe. Grabbing a moon rock sample, he would have made a perfect getaway until Spider-Man arrived on the scene. Tying a knot in the escaping arm, Spider-Man was unprepared for the two other arms that slipped into the room via an open window. Battling with the limbs, Spider-Man discovered that the arms that attacked him were actually attached to a remote unit. As Spider-Man freed himself from the metal limbs, one of the lab's scientists discovered that Doctor Octopus had actually stolen a chunk of relatively worthless quartz. Later, Doctor Octopus struck again, this time robbing a diamond exchange. From the confines of his hidden sewer lab, he made his tentacles ten times as strong with the materials he had stolen. When Spider-Man found his lab, he quickly subdued the webslinger. Using his newly made sonic quartz vibrating tentacle, he paralyzed the hero before moving in with a diamond-tipped buzzsaw attachment, which he used to slice apart a nearby ladder's steps, which he used bind the prone hero to the wall. Seeing Spider-Man bound, Doctor Octopus slipped into his escape vehicle and destroyed a water pipe. He laughed as the room quickly filled with water. Driving the submersible craft into the harbor, Doctor Octopus began to move into phase one of his master plan. Spying an oil tanker just entering the harbor, he used his newly enhanced tentacles to disable the ship and its crew before stealing the crude oil. From there, he repeated the theft on other ships, stealing more and more oil. At another hijacking, Doctor Octopus ran into Spider-Man again. Using his new tentacles, he tried blasting and slicing the hero, driving him underwater as well as taking time to capture the Daily Bugle's newscopter. He released the copter when the oil tanker, fixed by Spider-Man, lurched towards him and forced him to dive. Seeing Spider-Man swimming away, Doctor Octopus followed him, unaware that Spider-Man was luring Ock into the same part of the bay being used by the US Navy. 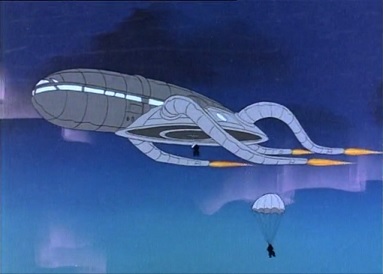 When Ock used his tentacles outside the sub from inside the sub, Spider-Man webbed them together, allowing Ock's vehicle to be easily taken aboard the Navy destroyers. (The Incredible Hulk cartoon episode - "Tomb of the Unknown Hulk" (fb) - BTS) - At some point, Doctor Octopus escaped custody and built a massive airship. (The Incredible Hulk cartoon episode - "Tomb of the Unknown Hulk") - Doctor Octopus watched with glee as he monitored the levels of cosmic rays. Noting that they had increased and isolated an American Army base from radio communication, he boasted that he would soon steal the world's most powerful explosive, the Perium-99 isotope. A short time later, while piloting his airship, Octopus ordered his men to begin Operation: Overthrow. Despite one of his men being captured as he snuck into the Army base, Doctor Octopus waited until the cosmic rays totally shut down outside communications before launching his own attack. As the base was now paralyzed, Octopus left his ship and destroyed the base's power supply. With the troops disabled and the base cut off from the outside, Octopus rounded up General Ross, Major Talbot and Dr. Ross. When asked how he so easily captured the base, Octopus boasted that he had inside help. When Rick Jones' friend Rita arrived to check on Jones, Ock's men brought her to Doctor Octopus. Octopus continued to boast, proclaiming that with the Perium-99 in his possession, he would conquer the United States. At daylight, with his men suffering from food poisoning thanks to Rio, a local restaurant owner who had snuck on base with Rick Jones, Octopus swore revenge. Despite Betty Ross' attempt to distract Doctor Octopus while she escaped, he ignored her, instead stealing a satellite containing the isotope and escaping the lab. Attaching the satellite to a nearby missile, he boasted that in fifteen minutes, the missile would launch, thus achieving his goal. When Rick Jones tried to use a paralysis ray that he had taken from one of Ock's men against Dr. Octopus, Octopus easily swatted the ray gun aside, unaware that the scene was somehow being broadcast on a nearby camera, which was being viewed by Bruce Banner. When Banner arrived on the scene as the Hulk, Octopus tried to flee, but the Hulk shattered the ground under his feet. Attempting to use one of his paralysis ray guns, Octopus fled when the ray proved utterly ineffective. Destroying a fuel truck in his attempted escape, Octopus watched as the Hulk easily put out the fire. Using his tentacles to bind the Hulk, they proved useless when the Hulk broke free and tied them all in a large knot. He then laughed at the gamma infused goliath as the missile launched, declaring victory despite his defeat by the Hulk. He, along with the rest of the base, watched as the Hulk knocked the missile off course, witnessing it crashing harmlessly into the desert. After the missile was destroyed, Doctor Octopus was placed in a cell, where he sulked, waiting on Federal agents to take him into custody. 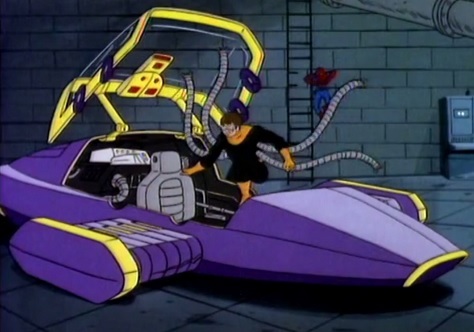 (Spider-Man and His Amazing Friends cartoon episode - "Spidey Meets the Girl from Tomorrow" (fb) - BTS): Octopus apparently escaped from custody and either set up a lab inside a sunken galleon or built a mobile lab to resemble a sunken ship. (Spider-Man and His Amazing Friends cartoon episode - "Spidey Meets the Girl from Tomorrow") - Monitoring his ship's radar system, Doctor Octopus tracked the crash landing of alien siblings Bartow and Ariel. Tracking the ship down, he listened as Peter Parker, who had seen the crash via telescope, talked about the ship's time travel capabilities and swore to capture the craft. Announcing his arrival, he opened fire on the two aliens with concussion blasts from his tentacles. He was knocked back thanks to Ariel’s mental abilities and his tentacles were webbed by an arriving Spider-Man. Easily breaking the webbing, he was about to press his attack when Iceman and Firestar arrived. Calling the resulting confusion his perfect chance, he tried to steal the crashed space ship when Spider-Man tied his metal arms into a knot. Octopus untangled his limbs but the combined forces of the aliens and the Spider-Friends was enough to drive him off. Unknown to all of them, a piece of Octopus' metal arms was left behind and through that, he was able to monitor what the heroic group was saying. When they split to search for the needed bits of fuel for the ship, he proclaimed it would be the perfect time to make his move, as the ship was totally unguarded. Returning to the forest crash site, he was enraged when he was unable to find the ship (unaware of the cloaking device onboard), but he was soon impressed when a sudden snowfall revealed the ship's location. His anger returned as his scanned it at his lab and found nothing workable on the ship. His anger subsided when he realized that was why everyone had left. Deciding to wait, he figured that he would let everyone else do the work for him and when the group arrived back at the clearing, Octopus demanded the chemical fuel or else he would destroy the ship. As the Spider-Friends attacked, one of his free tentacles attacked Bartow, dragging the now sick alien back to Octopus. He offered to trade the alien youth for the chemicals and gave them one hour to decide. Minutes later, Doctor Octopus was surprised when the Spider-Friends found his lair and dragged it to the surface. Thrown from his sunken ship lab as it crashed into the shore, Doctor Octopus' tentacles were melted into a solid lump thanks to Firestar and he was seemingly left behind in the snow when Spider-Man departed with the aliens. Comments: Created by Creighton Barnes, Doug Booth, Francis X. Feighan, Donald F. Glut, Jack Hanrahan, Christy Marx, Larry Parr, Jeffrey Scott and Marvel Productions, Ltd. (see Appearances list for complete list of artists). No origin is given in any show, and there is nothing to suggest his name is Otto Octavius. His agents all look generic. "Spidey Meets the Girl from Tomorrow" was the 6th episode of Spider-Man & His Amazing Friends' third season and written by Dennis Marks. 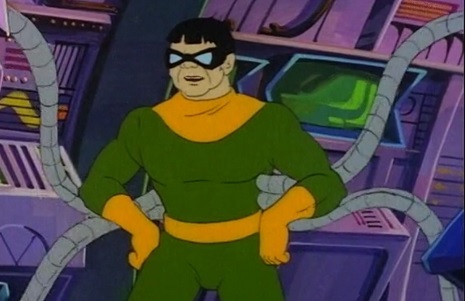 According to a few online sources, Doctor Octopus was voiced by Stan Jones in the '81 series and Michael Bell in the Amazing Friends and Hulk series. An airship equipped with tentacles. Doctor Octopus and his men flew the ship to the base to steal the Perium-99. After his capture, the fate of the ship was unrevealed. 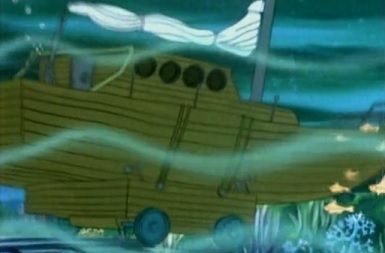 -The Incredible Hulk cartoon episode, "Tomb of the Unknown Hulk"
A lab either built inside a sunken ship and made to look like a sunken ship. Doctor Octopus moved the ship onto land via a wench and tracks. After it was forcibly dragged to the surface and crashed into beach, it’s final fate was unrevealed. 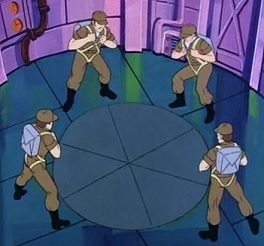 -Spider-Man & His Amazing Friends cartoon episode, "Spidey Meets the Girl from Tomorrow"
Agents in Doctor Octopus’s employee, they were issued with paralysis ray guns. One of them was captured when his ray bounced off of Major Talbot’s officer insignia and struck him instead. The rest slipped into the barracks and froze the rest of the troops. Two of them were ambushed by Rick Jones and knocked out by him and General Ross. Three of them were later assigned to kitchen duty and disabled by food poisoning caused by Rio. The rest were laid low by the food Rio tampered with.